Quinoa is not only delicious and naturally gluten-free, it contains iron, B vitamins, magnesium, phosphorus, potassium, calcium, vitamin E, and fiber. It is one of only a few plant foods that are considered a complete protein and comprised of all essential amino acids. Shrimp is also a great source of protein. This recipe is yummy and sure to please! In a strainer, rinse the quinoa under running water. Heat the olive oil in a large pot over medium heat. Add the onion and garlic and cook for 3 minutes or until the onion softens slightly. Add the quinoa and ½ teaspoon of chili powder. Saute for 1 minute then add the broth. Bring the broth to a boil uncovered. When it starts to boil, reduce the heat to the lowest setting, cover and simmer for 20 minutes or until the water is absorbed and the quinoa is cooked through. Remove from heat, add the parsley and mix well. Heat ½ tablespoon of olive oil in a large skillet over medium high heat. When the pan is hot, add the shrimp and sprinkle with ¼ teaspoon of chili powder. Season with salt and pepper and saute until no longer translucent. Add the garlic and cook until is very fragrant. 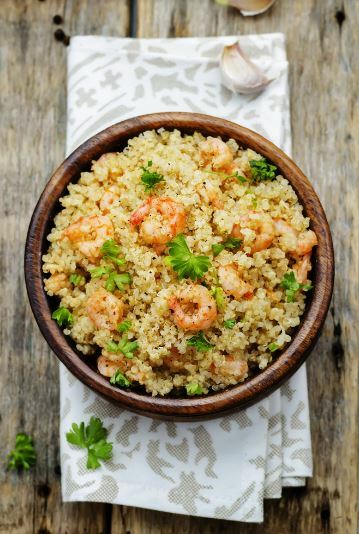 Mix the quinoa and shrimp together, drizzle with lemon juice and sprinkle with fresh chopped parsley. Serve the spicy garlic shrimp and quinoa immediately. Enjoy!